The school year is coming to a close and kids will be playing around water. This time of year is the time to stress water safety, as we live in a state surrounded by water and within our state are many lakes, ponds and swimming pools. Kids need constant supervision around water – whether the water is in a bathtub, a wading pool, an ornamental fish pond, a swimming pool, a spa, the beach or a lake. 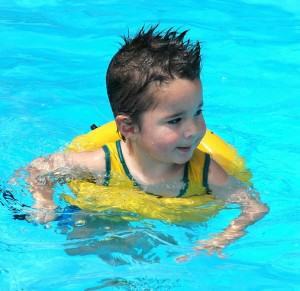 Young children are especially vulnerable – they can drown in less than 2 inches of water. That means drowning can happen where you’d least expect it – the sink, the toilet bowl, fountains, buckets, inflatable pools, or small bodies of standing water around your home, such as ditches filled with rain water. Always watch children closely when they’re in or near any water. If you don’t already, it’s a good idea to learn how to swim, and kids older than 4 years should learn too. Kids who are younger (but older than 1) also might benefit from swimming lessons, but check with your doctor first. Don’t assume that a child who knows how to swim isn’t at risk for drowning. All kids need to be supervised in the water, no matter what their swimming skill levels. And infants, toddlers and weak swimmers should have an adult swimmer within arm’s reach to provide “touch supervision”. To find swimming lessons in your area, contact your local YMCA or check with your city’s Parks & Recreation Dept.